Famous Azerbaijani designer Rufat Ismayil will take part in the New York Fashion Week show. His collection "Butterfly Effect" will be presented as part of the fashion show, Azertag reported. 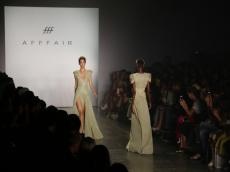 Rufat Ismayil became the first and only Azerbaijani and Turkish designer to date, whose collections were shown at such significant events in the fashion world as Italian, Dubai, Turkish, Iranian, Beirut fashion weeks. For the first time, Azerbaijan was represented by Rufat Ismayil at the New York Fashion Week on September 7, 2018. His fashion collection “Power of Fire" stunned fashion lovers. Following the successful first show, Rufat Ismayil will again take part in the New York Fashion Week. The fashion show of his brand is officially included in the network of events of the New York Fashion Week for the second time on February 13. His collection "Butterfly Effect" consist of 34 looks. The fashion collection was inspired by the Monarch butterfly, which he saw during one of his visits to North America; Black, orange and white pattern can be seen both in the colors and in the structure of the fabrics used for this collection. Talking about the collection of the autumn-winter 2019-2020 season, Rufat Ismayil stressed that it is for strong, strong-willed and mysterious women who will tease with their breathtaking appearance, while being inaccessible. While creating this collection, the designer used luxurious materials, such as crepe-chiffon, silk and fabrics, custom-made with a pattern of the wings of a Monarch butterfly. The fashion collection features orange, emerald green and black colors. Rufat Ismayil is the Creative Director and Co-Founder of AFFFAIR brand. He is involved in the Collection Design and leads the innovative and creative lab of the garment production line. As a teenager he started modeling for fashion houses, which brought him the title of Best Model of Azerbaijan in 2000. He continued working as a model for major names such as Paco Rabanne and Valentine Yudashkin. Soon his passion for fashion shifted from modeling to creating his own looks. He decided to move to Istanbul to pursue the launch of his own label. That has been the beginning of "AFFFAIR" as it is now. Rufat is involved in all the areas of establishing a collection from design and creative direction, to being in charge of the textiles and garment production factory. Moreover, Rufat Ismayil was recognized as the best Turkish designer by Turkish Association of Fashion Designers. Rufat presented his unique and imaginative collections in Italy, Iran, Turkey, UAE and other countries. His men's clothing collection was shown at Pitti Uomo 2015, the most important International event for menswear and men accessories collections. The world's leading fashion publications, including Vogue magazine (Italy) wrote about fashion collection created by the Azerbaijani designer.